The ability to write neatly and quickly is an important element affecting success in school and in life. If you or your child needs to improve handwriting skills, you know the frustrations that these difficulties can generate and you know that may be hindering the progress that moves one forward to full academic success. There are several basic brain processes involved in handwriting. Binocular teaming, or the proper focusing of the eyes, requires integration between the two hemispheres of the brain. Writing neatly on the paper is a fine motor activity that requires significant eye-hand coordination and well developed fine motor skills. Most handwriting problems are caused by a sensory integration disorder that inhibits coordination and integration between the many brain structures and systems involved in the writing process. The question is simply this: how can I begin to address possible brain processing problems that may be making it difficult for me or my child to write neatly and quickly? 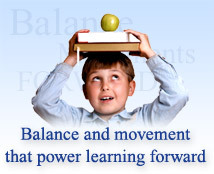 The Learning Breakthrough Program™ uses balance as a central component in addressing brain processing difficulties. Learning Breakthrough Program™ activities help develop greater integration between the two hemispheres of the brain as well as vital connections between the many other brain structures necessary to carry out the task of writing. Learning Breakthrough Program™ activities use a group of specially designed and carefully studied movements that improve eye-hand coordination and a range of other critical functions to enhance the development of the neural networks that are crucial to the process of hand writing. Click here to view a wonderful video presentation where teachers, parents, professionals and students speak about their experiences with the Learning Breakthrough Program™. To read about others' success stories with the Learning Breakthrough Program™, click here. To learn how the Learning Breakthrough Program™ works, click here.